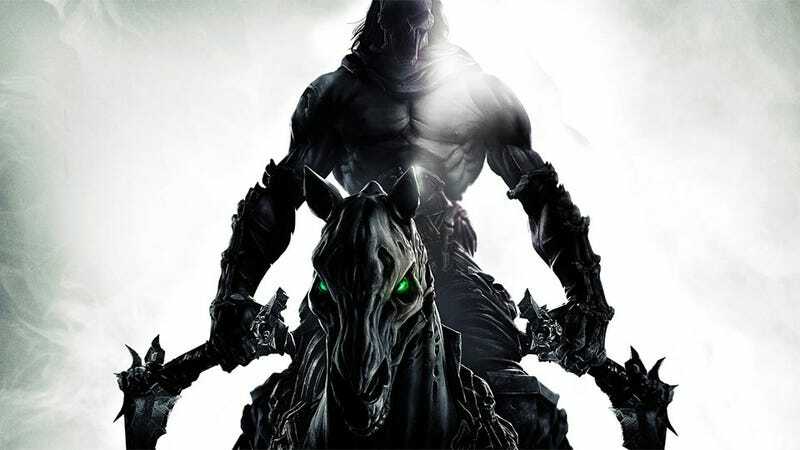 One of the sad and somewhat odd outcomes of today's big auction of top games and studios from game publisher THQ is that no one—not EA, not Activision, not Take Two, not Bethesda, not Ubisoft... no one—made a bid for the action-game series Darksiders and Vigil, the studio that made those games. Look, even here at Kotaku the Darksiders games aren't uniformly loved. But some of us dig them and we can now share the bittersweet news that some very talented game developers dig them, too. "In THQ's studio and IP selling off auction, Darksiders is unsold? [We] wanna buy it...on the cheap..."
Earlier today, some of us half-kidded that Nintendo should have snatched up Vigil. The Darksiders games are, more or less, an M-rated love letter to Zelda (please don't read that the wrong way!). Nintendo obviously didn't go for Vigil. If Platinum did? Or even went just for the series? We're not rooting for people to be out of work, but either result would be fascinating. We're following up to see what could come of this.